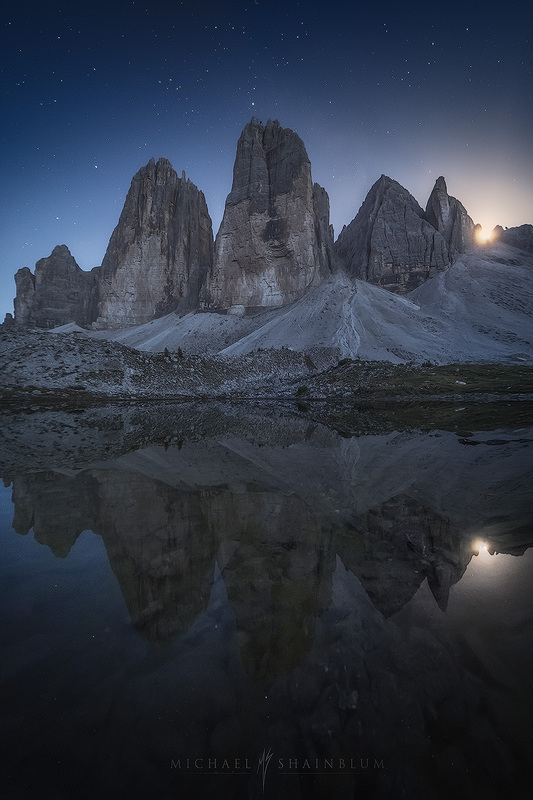 I am proud to share my second timelapse film featuring the Dolomites in Italy. 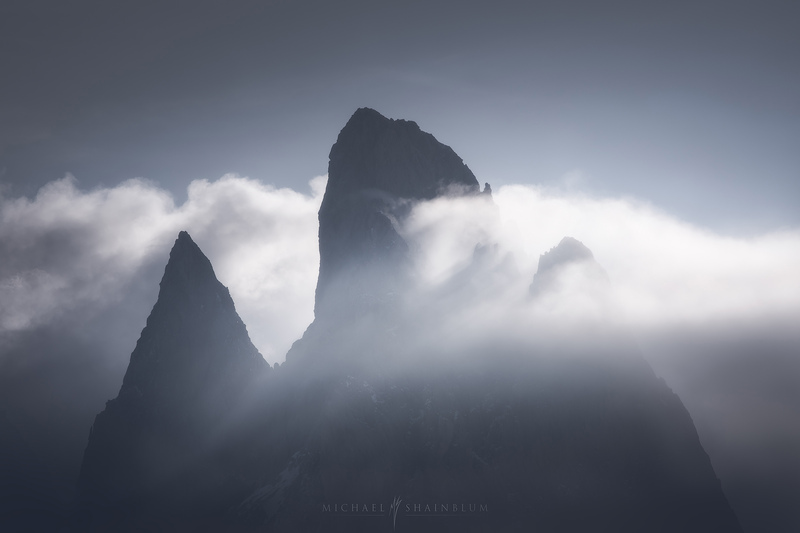 As the summer storms pass through, these mountains can be fogged in for long periods of time. Waiting them out can feel like a lost cause sometimes. Every once in awhile the storms break just enough to reveal some of the most incredible light. This video showcases the progression of the storm through the dark clouds and then focuses in on that special moment, when the light finally hits. Dolomites Timelapse Photography: “Breath of the Dolomites” is a collection of aerial clips and timelapse sequences from my first trip to the Dolomites mountains in Italy. The aerial scenes in this film were shot by Andrew Studer. 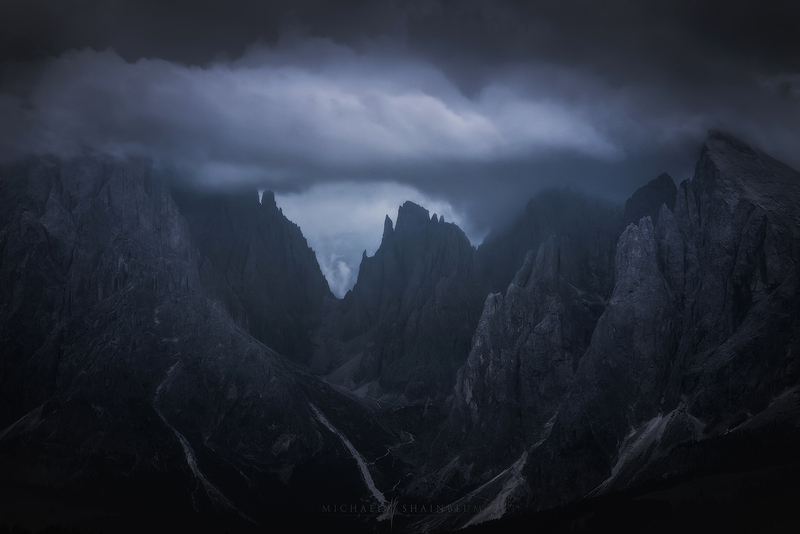 Below you will find my new Dolomites landscape photography collection from the trip. 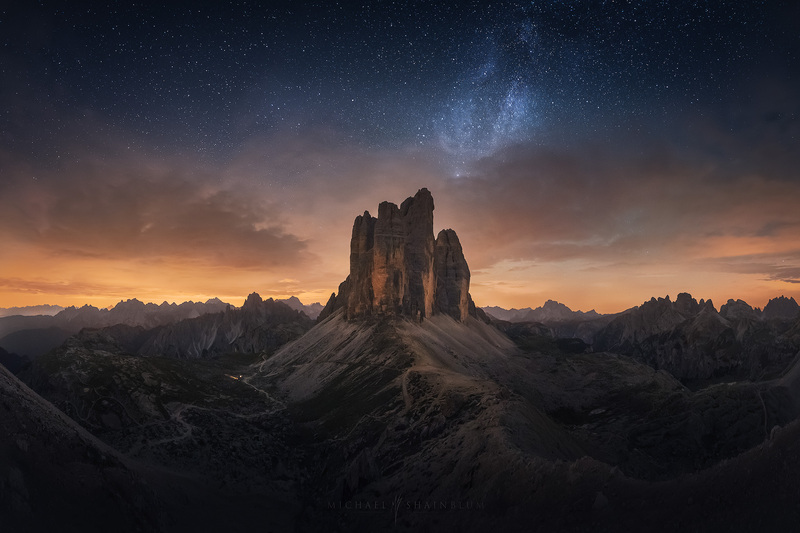 Tre Cime Milky Way Dolomites photography. 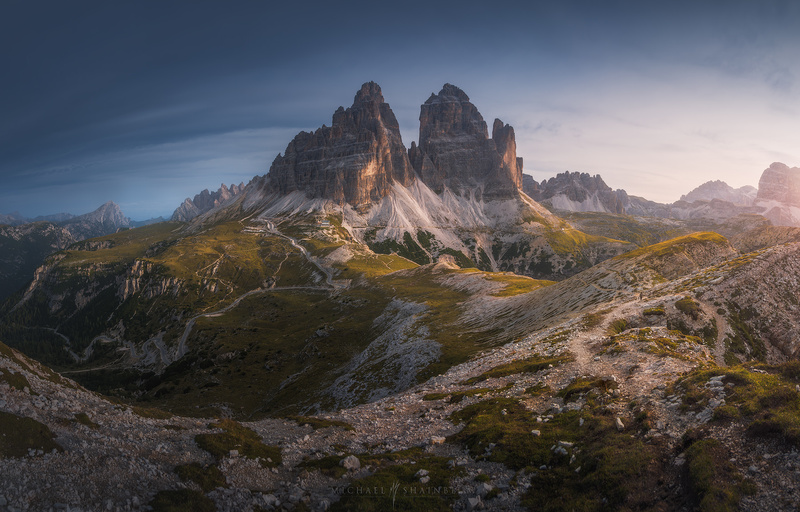 Tre Cime Di Lavaredo was one of the most amazing landscape locations I have ever had the pleasure to photograph. I took this 6 photo Milky Way panorama during an over night hiking adventure. 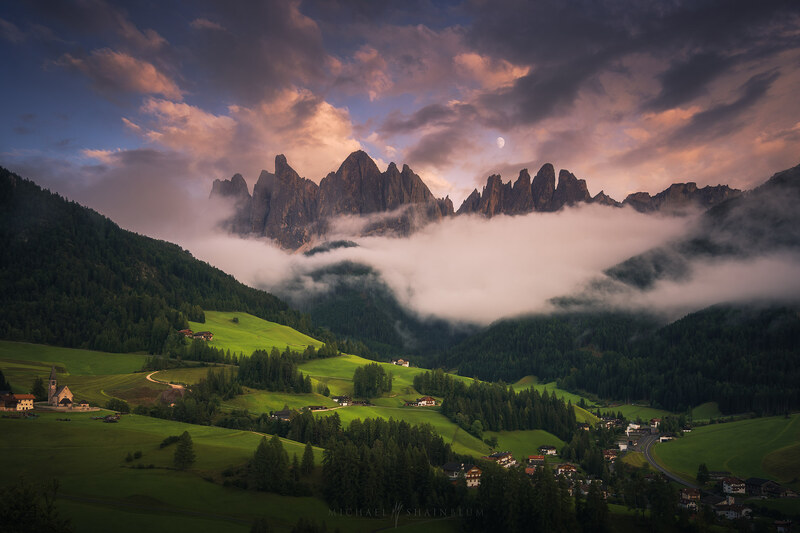 A still landscape photograph taken from a timelapse sequence at Val Di Funes in the Dolomites. This scene was hard to put into words. The sense of scale created by the tiny village contrasted by some of the most dramatic mountain peaks I have ever seen. 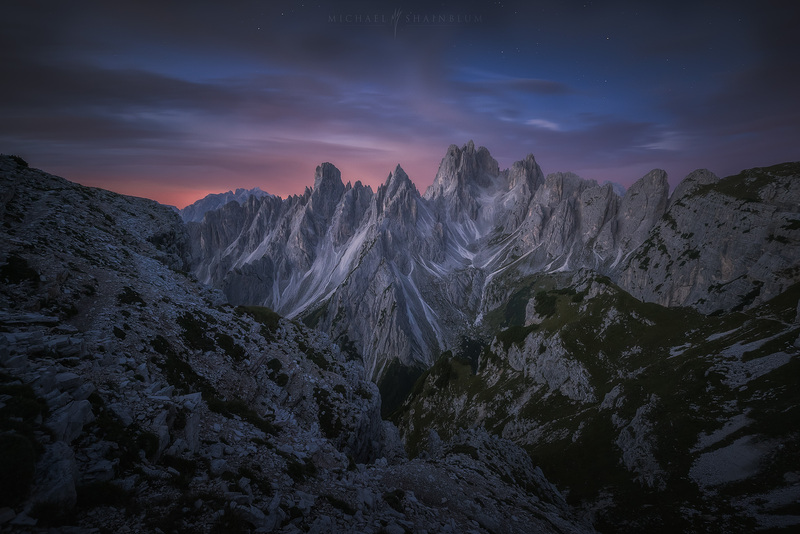 This is actually a still frame processed from one of the Dolomites timelapse photography sequences. We really lucked out with the beautiful fog and cloud coverage. 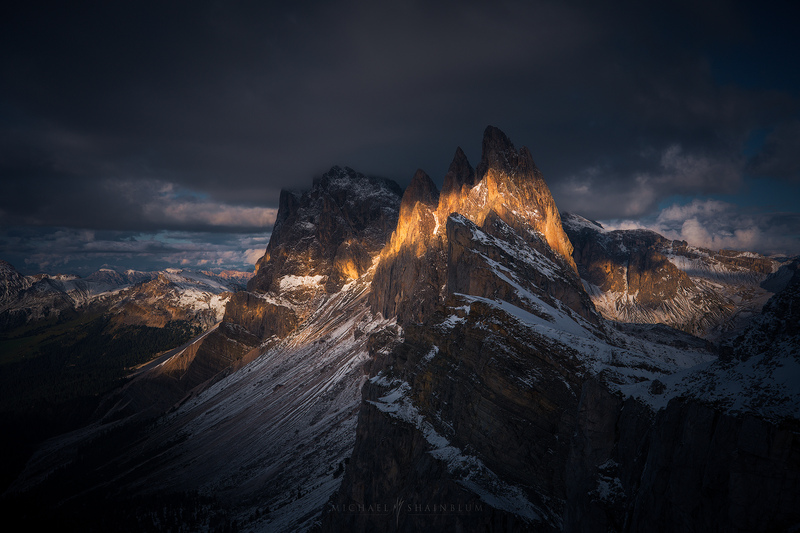 Tre Cime Di Lavaredo sunrise, dolomites photography. 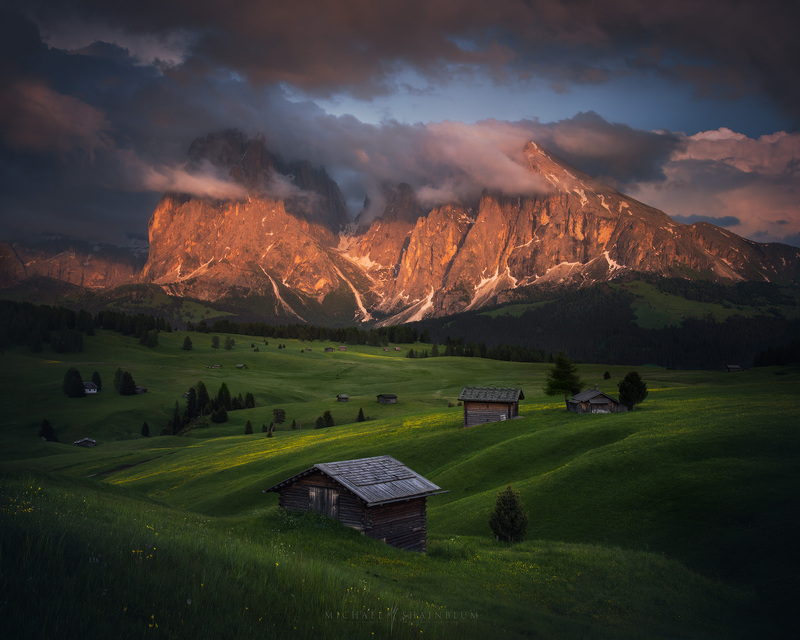 Mountain huts at sunset, Alpe Di Siusi, Dolomites photography. Landscape photography in the Dolomites. 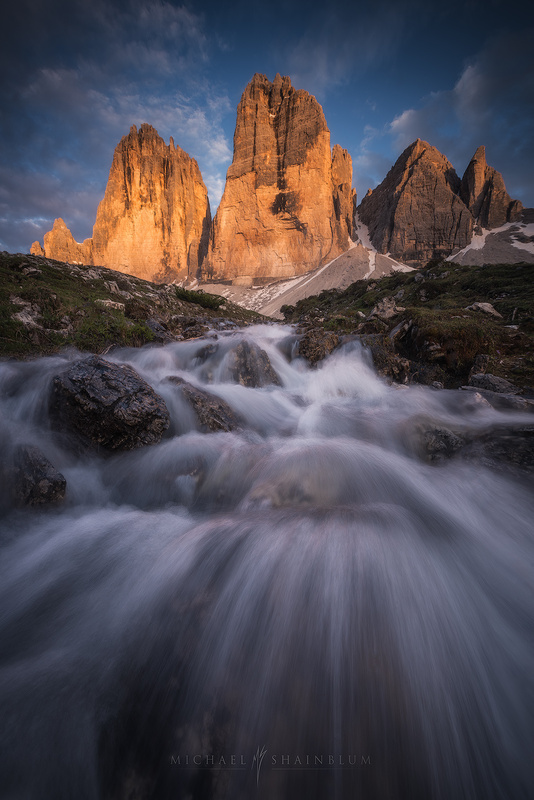 Tre Cime long exposure river sunset. 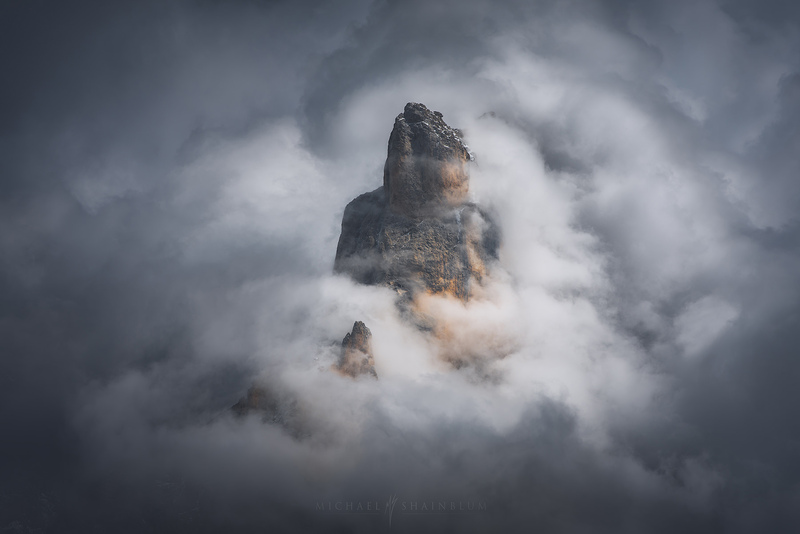 Wide Panorama foggy Dolomites photography. Here is a wider look at Gardena Pass in the fog. I loved watching the fog play with the mountain side in the distance. Here are two more foggy mountain scenes. I wanted to create a dark mood for these images, highlighting only certain areas of the photos. 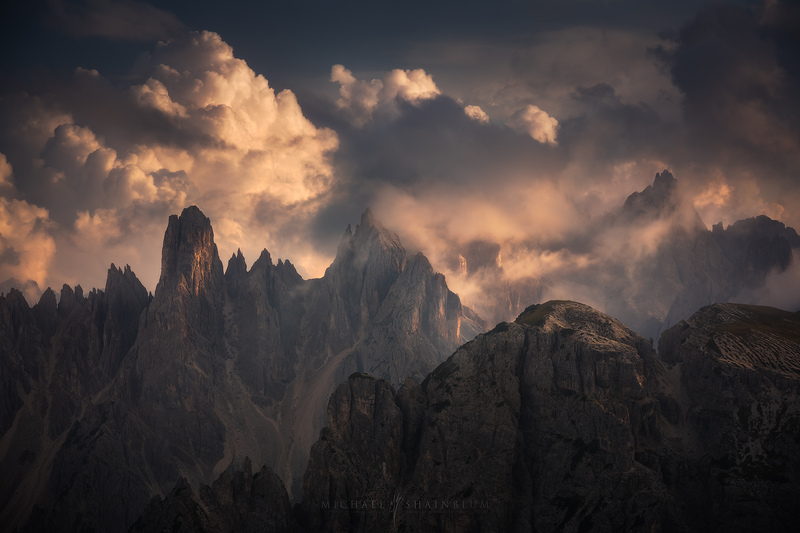 These peaks around Tre Cime were some of my favorites in the Dolomites. The glow around the peaks at sunrise made for a great mood. Landscape photography in the Dolomites. 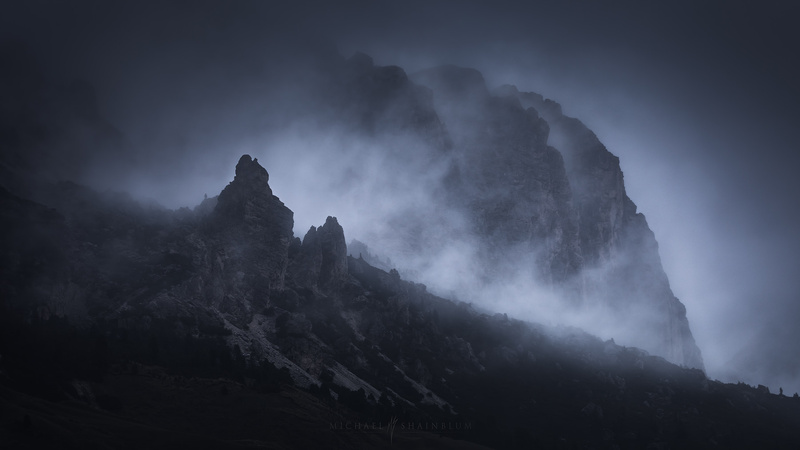 Stormy mountain, Passo Giau. 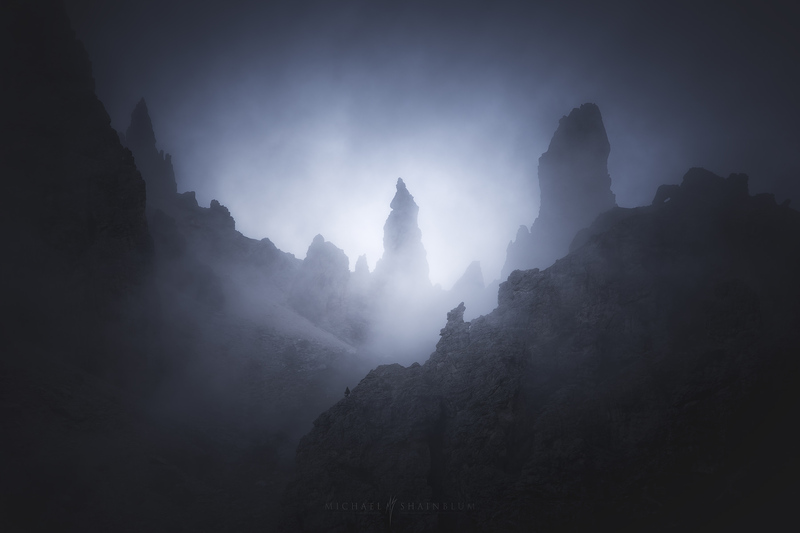 Foggy Dolomites landscape photography, taken at Passo Rolle. Fog exploded around the mountain peak creating some incredible movement. 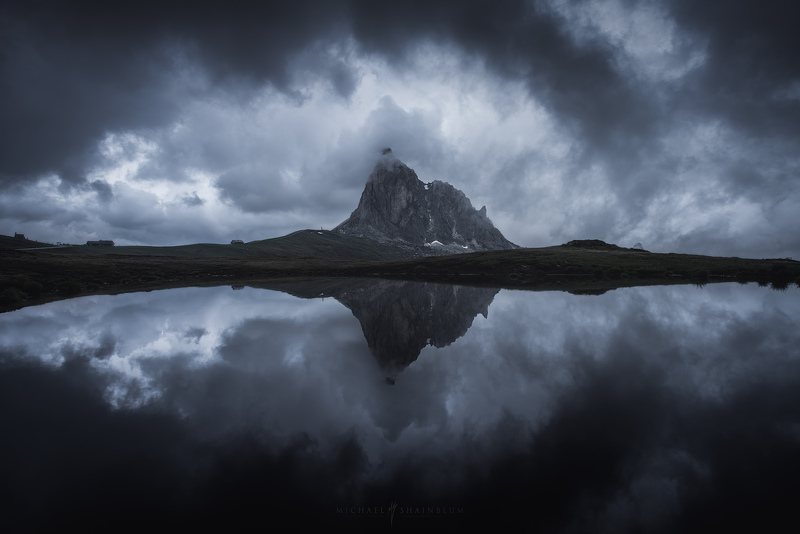 Landscape photography in the Dolomites. Tre Cime sunrise. 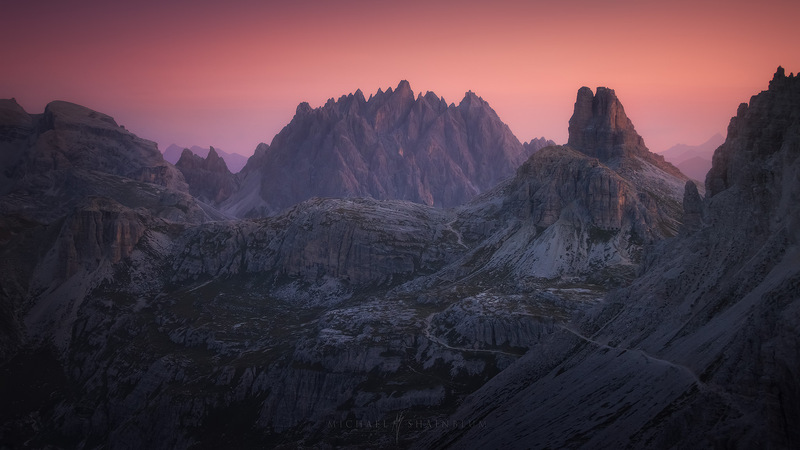 Dolomites landscape photography taken at sunrise. This scene didn’t even seem like reality. It felt as if I was in a fairytale. Although not quite as dramatic as some of the other scenes, the sunrise offered some beautiful pastel colors. 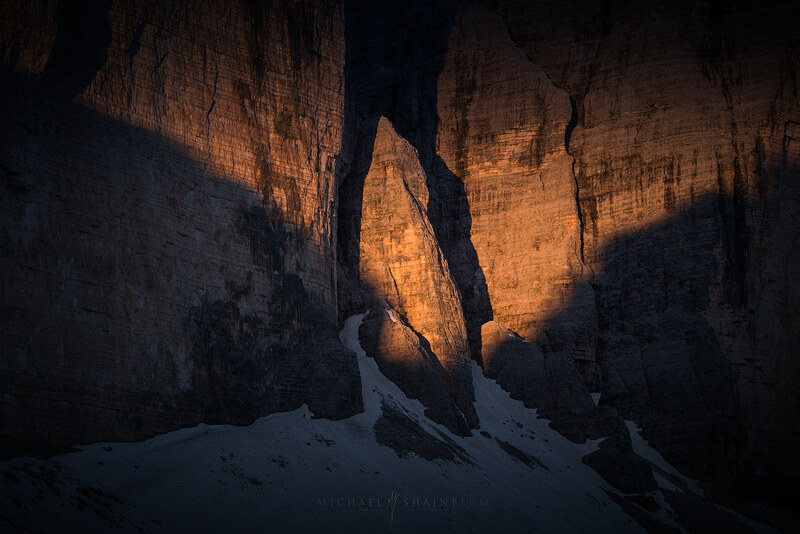 Seceda sunset in the Dolomites, landscape photography and dolomites timelapse photography. Seceda during an incredible display of light on the mountain peak. This was one of my favorite scenes to shoot. This photo is actually taken from one of my Dolomites timelapse sequences. Dreamy Seceda sunrise, Dolomites photography. I really hope you enjoyed viewing my timelapse film and Dolomites landscape photography collection. This was definitely a trip that I will not soon forget. I can not wait to experience this incredible place a second time. Amazing work! Thanks for sharing and keep up the spirit!! It inspires me! All your pics are so awesome my favorite ones are the great pics of San FRANCISCO I have all of them. Again thanks for your great work. Beutiful scenaries,first time I saw the Dolomite with that special lens,patience and waiting for the exact moments. CONGRATULATIONS!!! Outstanding!!! Thank you so much Sergio, I appreciate the comment! Amazing work Michael, very inspirational. Impressed Michael!! Well done my friend!! you inspire me! Fantastic compilation! Looks like an incredible experience. As hard as we try to convey to others the experience we had, we sometimes just can’t get there. I’m sure this was probably one of those times. Dolomites are on my bucket list! Outstanding. Thanks for sharing this landscape with us. Greetings from Bosnia. I’m 18 and from Germany and you sir you inspire me and I want to thank you for all of your work. So dynamic and dramatic. All photos are simply perfect. I N C R E I B L E!!!. Cuanta profesionalismo, cuanta bella reflejada por el lente de tu cámara. Muchas Gracias…saludos desde Argentina. :)!!! Such outstanding work, beautiful visuals love the photos and videos, am so glad I found you’re site when I was looking at the Inspiro theme. Well done!! You are, very literally, my favorite photographer at the moment. I would love to bounce a few questions of you if you ever have the time, or to buy you a beer if our paths ever cross amidst our travels. Keep up the good work mate! Amazing landscapes photos, thanks for sharing. Found this while researching a follow up destination to my recent Southern Patagonia trip. This may be the spot! BTW, I am used to seeing your work via IG on my phone, glad I am finally seeing the larger scale it deserves! My wife and I will be hiking in the Dolomites in June 2019. Your photos are inspiring and reflect the raw beauty of this region. We look forward to having a first hand experience of actually being there to take on the challenges over a one week hike. 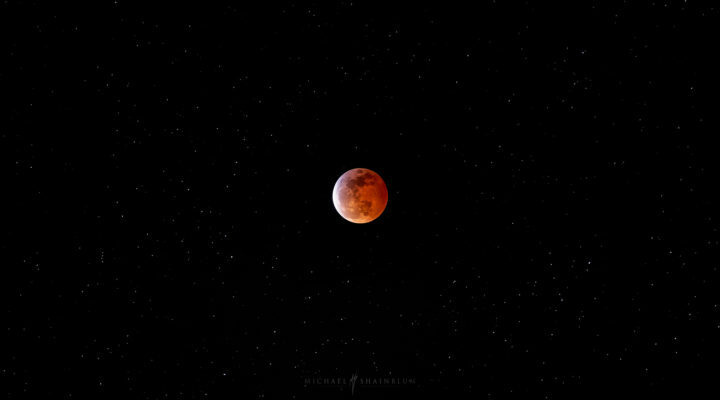 Keep up the great photography and thanks for sharing your images. I hope to be able to capture some ‘decent’ photos and have just joined the Melbourne Camera Club – check it out in the web. I will be in Sep 2019 and take a pic like your work.